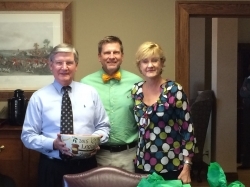 Stewart Melvin & Frost finished first in monetary donations in the local Georgia Legal Food Frenzy competition for the fourth straight year. Stewart Melvin & Frost’s collected $3,931 in monetary donations. The Georgia Legal Food Frenzy is a competition among law firms throughout the state to raise money and collects food for the state’s regional food banks. Stewart Melvin & Frost was one of 19 law firms in Hall and Forsyth counties that collected food and monetary donations for the Georgia Mountain Food Bank. Law firms in Hall and Forsyth counties collected 2,350 pounds of food and $10,757.50 in monetary donations for the Georgia Mountain Food Bank. Georgia Mountain Food Bank serves more than 61 partner agencies in Dawson, Forsyth, Hall, Lumpkin and Union counties. Founded in 1936, Stewart Melvin & Frost is one of Northeast Georgia’s oldest and largest law firms. The practice specializes in a broad range of legal services, including business law, tax and estate planning, municipal bond financing, real estate transactions, litigation, and mediation services. Based in Gainesville, Stewart Melvin & Frost serves a regional client base throughout North Georgia. For more information, visit www.smf-law.com.